I can see this token being problematic in terms of market liquidity if a large percent of buyers are speculators that bought thinking it would dramatically increase in value and when it doesn’t and they decide to bail since they have no machines to install, you would see fairly strong downward price pressure since a rational buyer looking to “use” the token would have bought during the token sale or is waiting for a better deal on the market, pretty much guaranteeing a decline in price. If the price actually increases I would be concerned that there was market manipulation given the complete lack of regulatory scrutiny over insider trading, pump & dump practices, etc. in this market. I am not sure that people who are speculating would bother to sell their tokens as much as you think. You can rent/lease them out. Should give a decent return even without installing any mining gear up there. Wondering why people seem to be so willing to store their mining rigs in their facility. What if the go brankrupt? Are you really sure, you will get your rigs back? Can you also always check upon your rig physically and basically just waltz into their facility to do so? 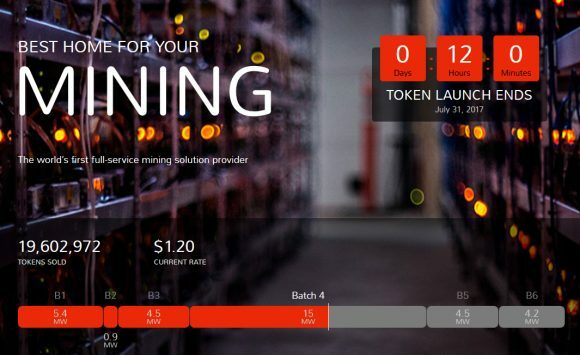 The same questions come to my mind everytime people post about a data center offering to host mining rigs. Am I missing something? I’m glad this sale is over and the commenters here who didn’t investigate giga watt and know about their history didn’t participate. More demand for those who saw what an amazing ICO this was. No it’s not a flip it get rich quick ICO pipe dream bulit on a whitepaper, it’s an actual real world project with the most trusted hosting company in the world with a CEO if you search his name on coindesk you would know didn’t leave Microsoft in 2011 to become one of the worlds biggest bitcoin miners just to steal your mining equipment or run an ICO. He is already wealthy from being early to Bitcoin, he’s doing what he loves, and built the most efficient mining platform in the world. Have fun renting my tokens or trying to compete with the operating costs of a Giga Pod mining in your basement. Sorry if I came off rude, but guys do your home work before making comments either critisizing it, complaining it won’t go up 5x which it probably will anyway, or asking questions that are easily answered on the website, whitepaper, google, Instagram, and putting the CEO name into coindesk to read some of his history in the industry. If I came off rude it’s because so many bad projects and scams are raising money because they make it easy for people to believe they can quickly flip it for fast profit, nobody reads whitepapers, and you souldn’t invest in a whitepaper anyway. This project is built fully funded without ICO money, the ICO was to decentralize and fund more Giga Pods. The tokens are only issued once a pod goes online…it’s the most honest project that has run an ICO yet. Really wish people did’nt throw money at whitepapers built on hype and ignore fully funded projects offering a great opportunity. Even if you chose not to invest in an ICO at least do some homework before throwing money at it. This was the most honest one I’ve seen, and don’t expect to see anything like it anytime soon with so many willing people ready to fork over money to ICO that are nothing more than an idea at best or pipe dream scam, but promise riches. Filecoin is next interesting ICO to me, but nowhere near as interesting as Giga Watt was. The rest are just out for your money, and you’re looking for the greater fool to dump onto for quick profits. That’s not sustainable.